Citizen’s Voice Tv (STOCKHOLM): Nordic Pakistan IT Summit is currently happening in Sweden’s capital Stockholm. Pakistan-Sweden Business Council’s (PSBC) Secretary-General, Mr. Syed Naseh had signed a Memorandum of Understanding with Mr. Barkan Saeed, Chairman of Pakistan Software Housing Association (PASHA) to organize IT Summit in November this year. Nordic Pakistan IT Summit is an integrated platform for IT communities of Pakistan and Nordic region to exchange ideas, network and grow business. The summit brings together industry experts & executives to discuss efficient cooperation and launch potential partnerships. The summit is about engaging business entities on both sides in Pakistan as well as in Nordic region. On the occasion, Senior vice chairman P@SHA Muhammad Zohaib Khan hopes that they will continue this journey for the next year as well. They are planning to extend the event for few more days to celebrate a full technology week for the partial point of view and the stakeholders. 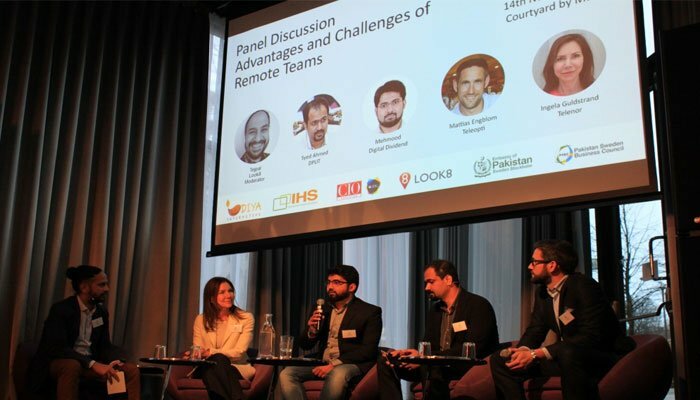 Last year, PSBC (Pakistan Sweden Business Council) had organized its inaugural Nordic Pakistan IT Summit in Stockholm last year for the first time. The main purpose of the event was to connect, engage, and allow networking of companies from Pakistan and Nordic region.